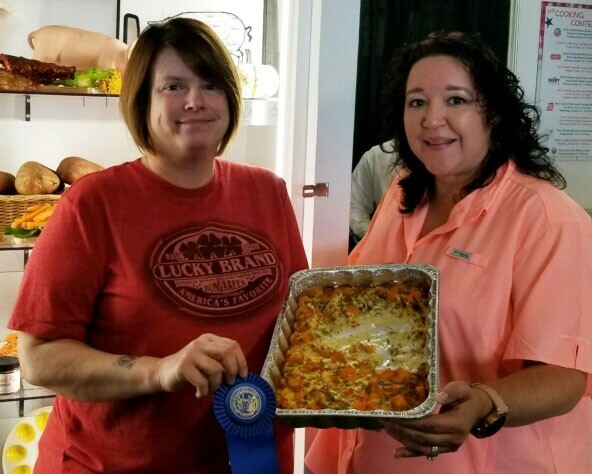 Christi Broadway, left, and CoCo Daughtry of the North Carolina Sweet Potato Commission with the blue-ribbon sweet potato breakfast casserole. The N.C. State Fair may be just a memory, but you can make this blue-ribbon breakfast casserole any time you want. Christi Broadway of Raleigh took home first prize in the “Quick and Easy” meal category for her hearty dish. It comes together quickly and will keep a houseful of hungry relatives happy. The recipe contest was sponsored by the N.C. Sweet Potato Commission, and all the entries had to use the vegetable as a base. The casserole has the added benefits of being dairy-free, gluten-free and Whole30 compliant. If you could use more ideas on entertaining guests with special diets, check out this expert advice from our holiday issue. Cook and crumble sausage. Drain excess grease from the sausage, and set aside. Heat oil over medium-high heat in a skillet; add cubed sweet potatoes and cook until soft, about 15 minutes. 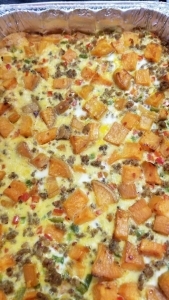 Combine cooked sausage, sweet potatoes and peppers. Pour into a 9-by-13-inch baking pan. In a separate bowl, whisk together eggs, almond milk, garlic powder, onion powder, and salt and pepper (a few shakes of each). Pour egg mixture evenly over sausage mixture.